9:30 am 20th November, Occupied East Jerusalem: Israeli forces have again demolished the protest camp in Sheikh Jarrah, set up after the eviction of the al-Kurd family on the 9th November. 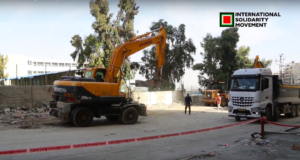 A bulldozer arrived at the private property at 8:45am with orders to destroy the tent and the surrounding fence where the al-Kurd family has been living since they were evicted from their home on the 9th November 2008. The camp is situated on Palestinian-owned private property. The Israeli bulldozer later created a wall surrounding the residents who remained on the site of the protest tent. The wall that the Israeli forces are creating is on Palestinian owned private land. Yesterday the tent was also demolished, and one Palestinian and four internationals were taken into Israeli police custody. 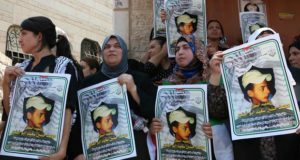 The Palestinian resident of Sheikh Jarrah continues to be held. The family re-constructed the tent yesterday in order to continue their protest. Today, while the fence surrounding the private land was being bulldozed, neighbors dismantled the tent in order to save it from repeated destruction. The decision to remove the al-Kurd family paves the way for the takeover of 26 multi-story houses in the neighborhood, threatening to make 500 Palestinians homeless and signifying the ethnic cleansing of Palestinians from Occupied East Jerusalem by the Israeli State. In July the US State Department brought forward an official complaint to the Israeli government over the eviction of the al-Kurd family, openly questioning the legality of terms on which the Israeli Jewish settler group claimed to have purchased the land. (see www.haaretz.co.il/hasen/spages/1005342.html). In 2001 settlers began occupying an extension of the al-Kurd home. 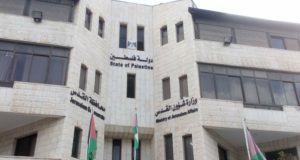 Despite the fact that their claim to the land was revoked, settlers were given the keys of the al-Kurds family home extension by the local Israeli municipality. This was possible after the municipality had confiscated the keys of the extension that the al-Kurd family built on their property to house the natural expansion of the family. When this extension was declared illegal by Israeli authorities, the Israeli municipality handed the keys over to Israeli settlers. The al-Kurd family went to court and an eviction order was issued against the settlers. When the al-Kurd family were evicted on the 9th November 2008, the settlers were allowed to remain in the property, despite their own eviction order.